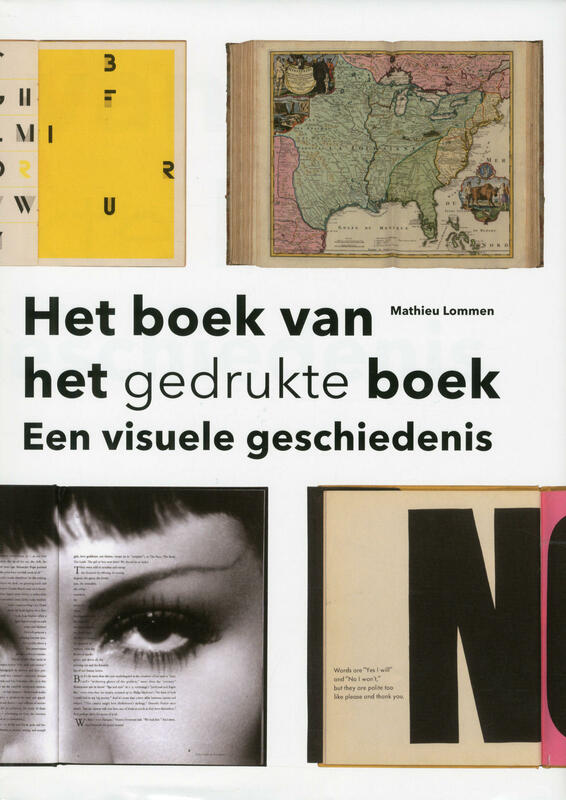 So for all who missed that exceptionally beautiful and well designed exhibit at the Special Collections of the UvA (University of Amsterdam) can still dream away online at home because students from the Foundation Years D_Group went there for you and selected their favorites, . 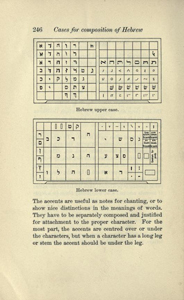 Scroll down and enjoy…..
A treatise on type-setting by hand and by machine and on the proper arrangement and imposition of pages. 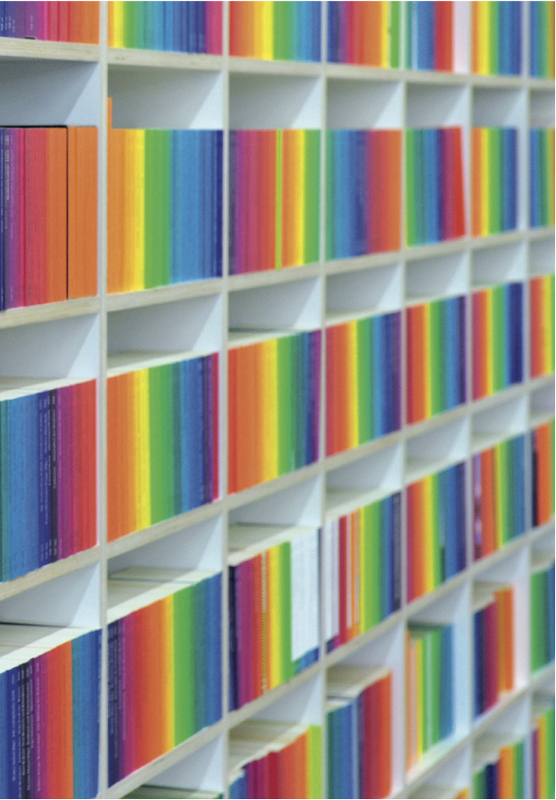 The form of the book itself is somewhat flat and stale. 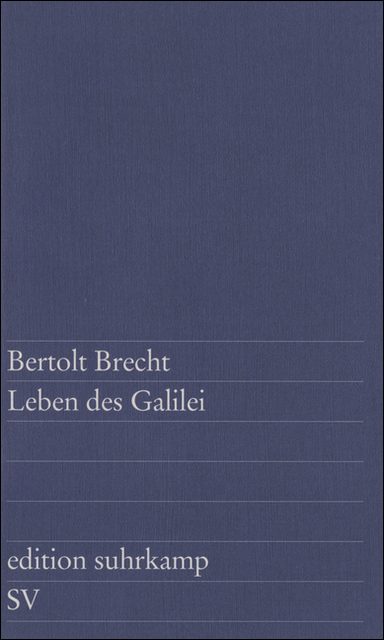 The cover is made with a bleak brown, the color of mud that is unpleasant to see. 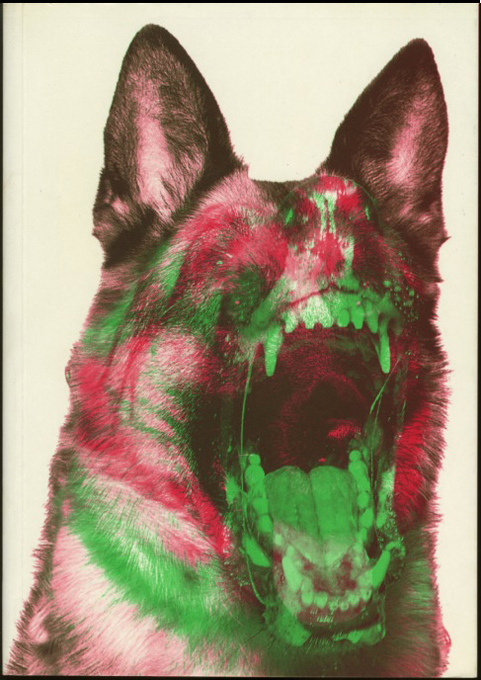 which also is one of the only things inviting of this book cover. A bit ironic, knowing that the book is based on design of type letters and typography which tell us absolutely nothing about the book from the outside. only tiny detailed letters sown and marked in the book. how to make these various designs in your work. 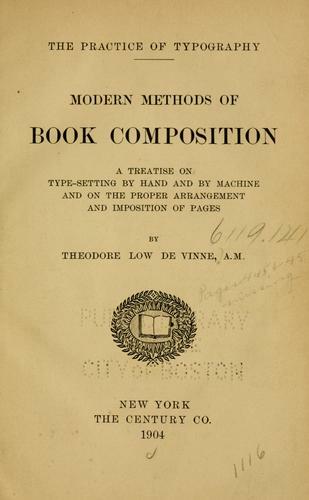 basically it is an ideal book for “how to” to authors, giving specific rules and certain explanation of type design in the early 20th century. Now off course that is different, type design has progressed in different area’s of art and literature making more creative and appealing for the readers. 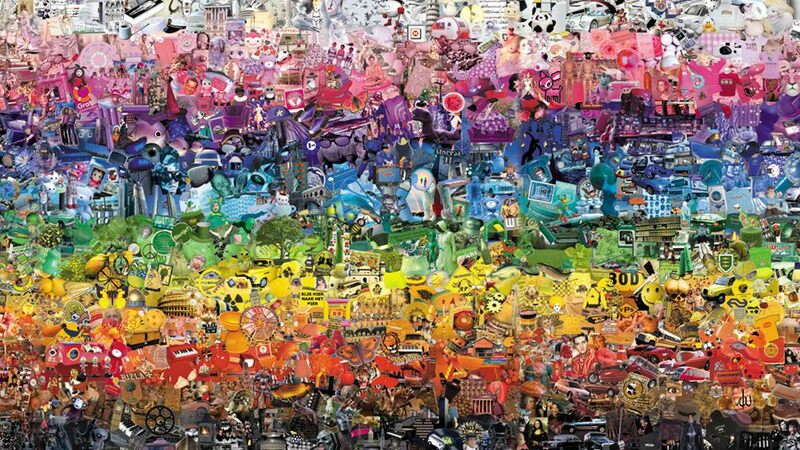 For me, it is an important element in the wide field of the arts especially for design and graphic design. Typography and Type design is is the core process of the work from beginning to the end, and the key element of it all. Its an easy decision but hard work, from authors deciding on the letter type, writing an email for your mother, or designing a poster for the next party. With Typography and Type design we are our most oblivious, and lacking an active conscious of what really is letter type and where does it come from. 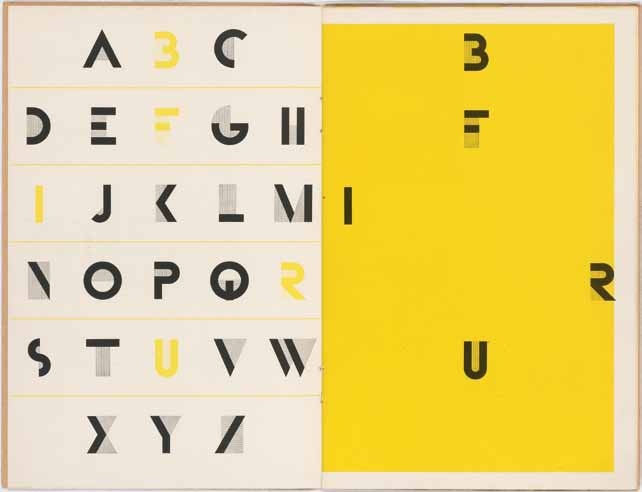 anyway, i just think this is good start on learning of typography,especially if you’re in graphic design, to understand how they managed in the early years from the first equipments to now. 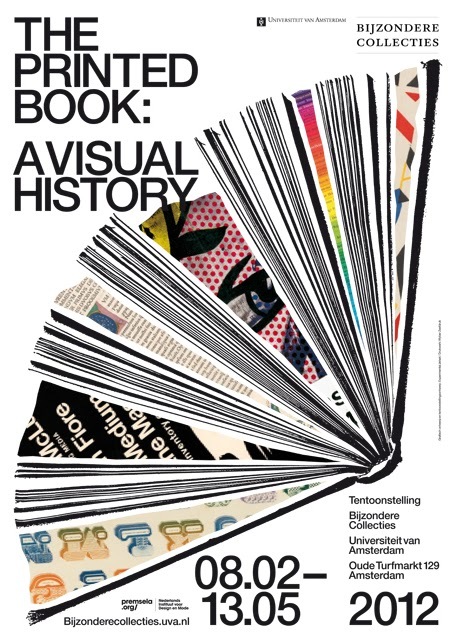 Als ik terug denk aan Vrijdag 11 mei, 13.20, UVA special collections, alleen en de laatste dag van de expositie “The Printed Book A Visual History” komt het werk van El Lissitzky als eerste op in mijn gedachten. Niet alleen vanwege mijn voorliefde voor het Russische alphabet, maar ook de simpele en moderne typografie en de duidelijkheid van het bericht dat wordt doorgegeven. Ik spreek geen woord Russisch maar toch is het boek zo begrijpelijk en universeel. De karakters worden in sommige gevallen zo vergroot dat het abstracte vormen of illustraties worden. Evenals in de Thumb-index aan de rechterkant van de paginas worden de letters als symbolen gebruikt. 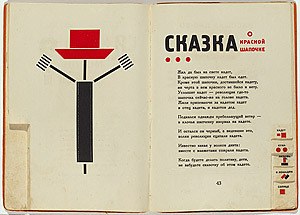 Een boek geschreven door de Poët Vladimir Mayakovsky met de titel “Dlya golosa” (For the Voice) uit het jaar 1923. 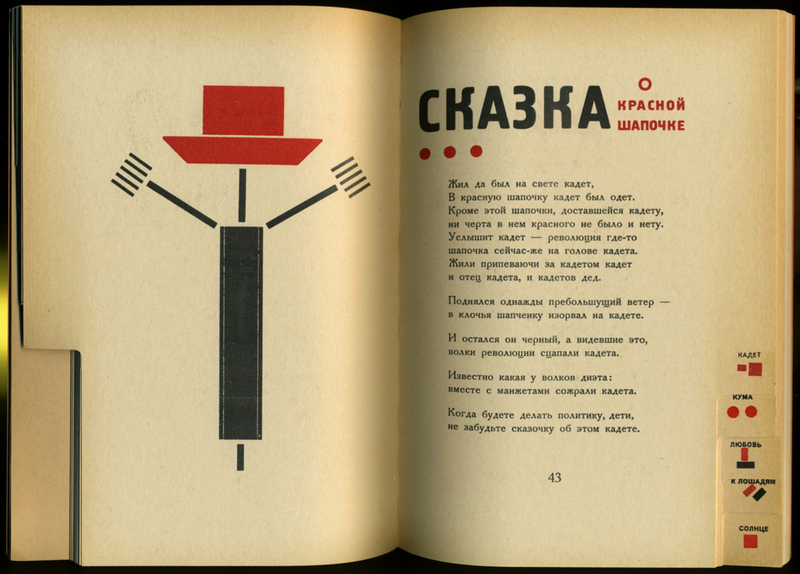 Mayakovski wordt gezien als een dichter die zijn tijd ver vooruit was, hoe El lissitzky daarop heeft gereageerd vind ik erg goed. Beide hadden ze een moderne abstracte visie op hun werk. Dit werk heeft mij geholpen en geinspireerd om een opdracht voor school (Sculpture) te vervolgen waarin communicatie heel belangrijk was. Het versimpelen van bepaalde factoren was uiteindelijke het belangrijke aandachtspunt. Wat mij aantrekt in dit boek is voornamelijk de compositie van de geplaatste afbeeldingen en tekst. Er zit een bepaalde beweging in die zoals de vinger al aanwijst. Maar ook dat de vinger naar buiten wijst suggereerd het naar meer. Ook de “collage”stijl spreekt mij erg aan omdat er een klein beetje diepte in het beeld komt. De opgerekte EN (zoals je die ook in de kop van een courant zal vinden) vindt ik de afbeelding ophalen en er ook zeker meer spanning in het totale beeld creeeren. De overige typografie vind ik simpel maar passend door de wat drukke achtergrond is het goede keuze om een schreefloos lettertype te gebruiken en het refereerd ook naar hoe tijdschriften de typografie gebruiken. Het valt mij op dat de zinnen geen hoofdletters gebruiken wat inhoudt dat het geen begin en einde van een zin is. Ik weet niet of ik dat nu storend vindt of geplaatst. De balans van de kleuren vind ik perfect door sommige delen transparanter te maken is niks overheersend en wordt je oog als het ware over het blad geleidt. The book I chose to write about is F. Nietzsche [x] ‘Also sprach Zarathustra’ designed of Belgian Flemish painter and architect Henry van de Velde in 1908. 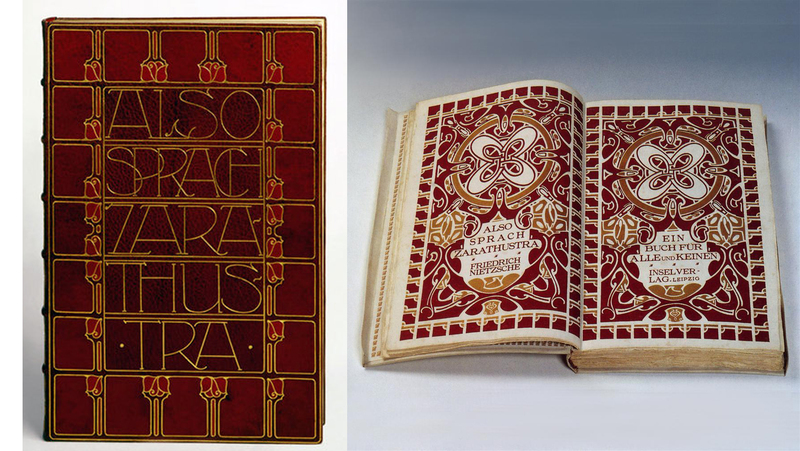 The design of this book immediately captured my attention, but when I saw the title I was involved even more because I also have an e-book version of ‘Also sprach Zarathustra’ so it was very intriguing to see this book in real. In this page layout we see a symmetrical duplicate composition which makes the whole design stronger and more impressive. The deep reddish – purple and gold colours palette gives it a very dramatic effect. The form of the image is massive and monumental and also flat but still decorative. The content of the illustration is quite abstract. H. van de Velde used organic motives which are creating a very dynamic atmosphere even if the framework has a very strict geometrical form though these two different patterns come together very well. Van de Velde leaves some ‘calm’ place for the text. The font of the title is solid and works with framework. The balance Henry van de Velde creates in his design is sophisticated. In conclusion it creates the feeling that there is just a thin line between simplicity and complexity. This image I chose to support this text is a cover which I designed myself for the book ‘Grimm’s Tales’ a year ago. 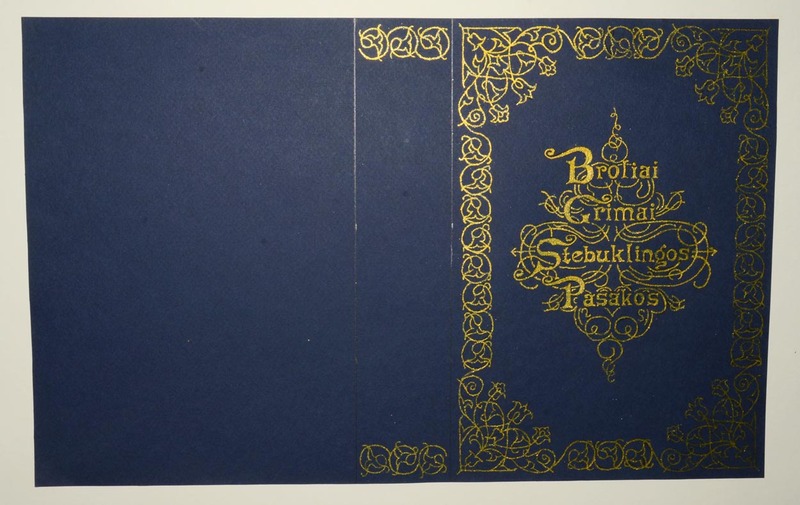 It is influenced by 19- 20th century typography. Between both images you can see some similar characteristics which are typical for that period. 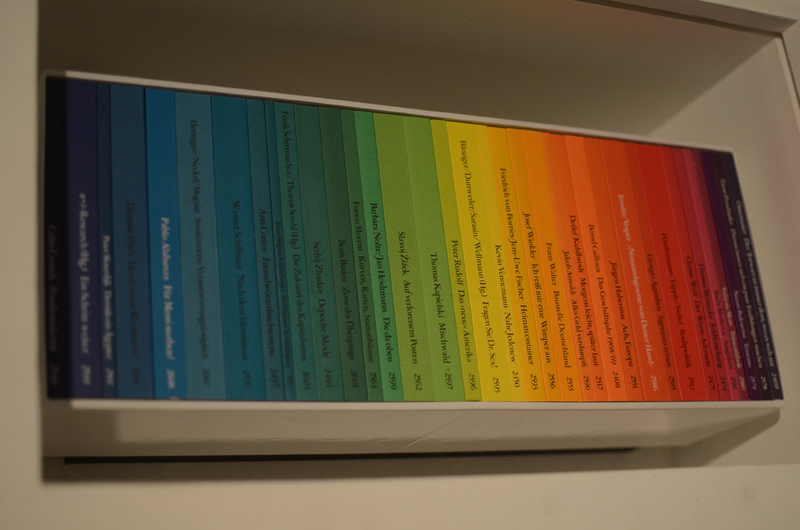 I found this book most interesting at the collection exibit I saw at the University of Amsterdam. A.M. Cassandre, whose real name was Adolphe Jean-Marie Mouron, was an Ukrainian- french graphic designer from the Interbellum period. He was designing posters and letter types. Bifur was poduced by Deberny & Peignot from Cassandre’s designs. The book is a publication of this font released in 1929. I chose this book cause i was impressed by a font itself and also the form of the book- how it was printed. I really like the simplicity and a specific character of it. The font was originally produced in 1- and 2-color versions. 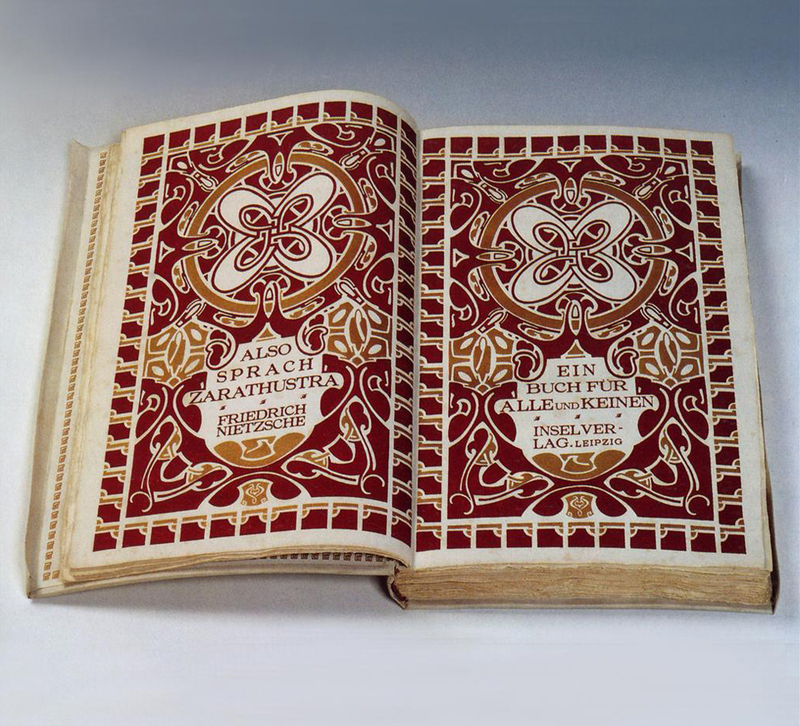 The one presented in the book is a 1-color version. I think visually it is very appealing and it was quite innovative for its time. The simplicity of the geometrical form, clarity of the message, funcionality create a beautifully balanced font. For me particularly attractive is the fact that some of the letters could be read as images and some of them as the letters with a small decorative element which anyway stays really simple. For example the lines in the letter „L” create the letter but in „M” they just create space around it. That makes me look at it, also the illustration in the book and not something that creates a readable image. I also like the way how it is presented in the book. I think the combination of this elegant form of the font and the yellow colour create an absorbing, unique image. 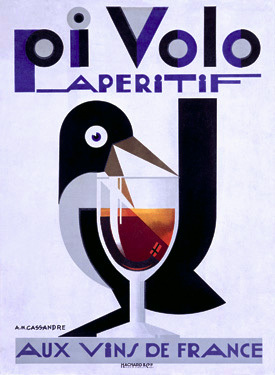 Personally i also like the posters of A.M. Cassandre and i think the font in his works is very well combined with the images and shows how important this connection is. A Printed Book History 10 : Two equals One ? This book is a collection of ferns found on the American continent. 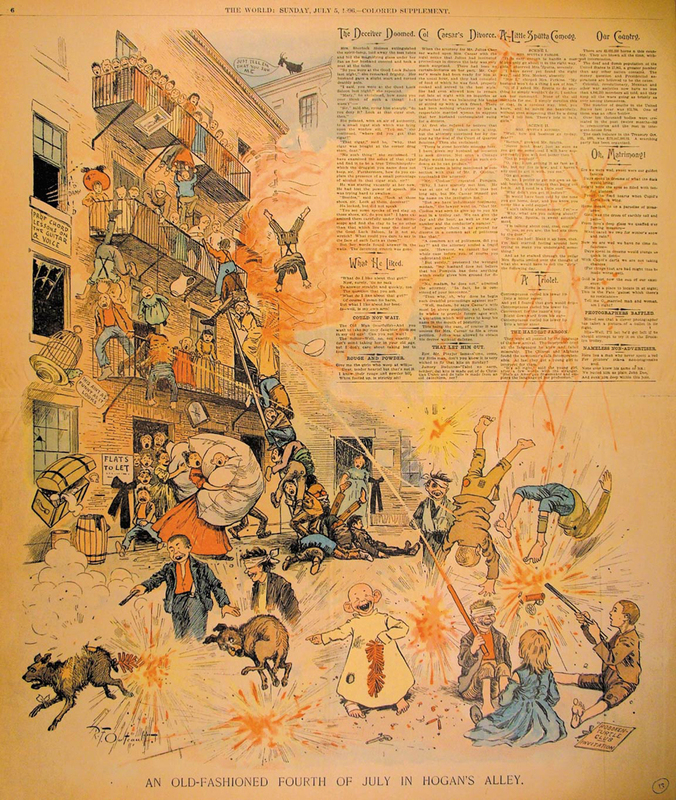 It was printed one year after the death of the author. Through the thin paper we see that every fern has it’s own leaf (Ironically). What I like about the book is that the Ferns seem to have adapted to the form of a book. They seem to have sprouted somewhere outside the confines, out of the eye and “grown” precisely inside the printing ratio and reached a perfect 1/?2 scaled size. I like how the fern leafs function as separate columns on the sheet. And the little leafs on it function as lines, and the dots on these leafs as unreadable letters. 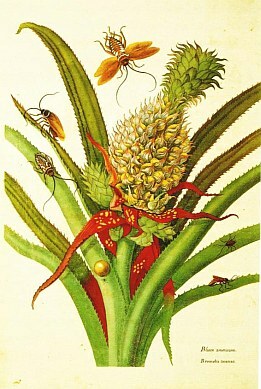 Traité des fougères de l’Amérique is printed on lain paper, a paper that was very often used in the 19th century. This paper has a watermark, thin lines of a thicker paper as nerves over the sheet. The lines are formed by a dandy roll. 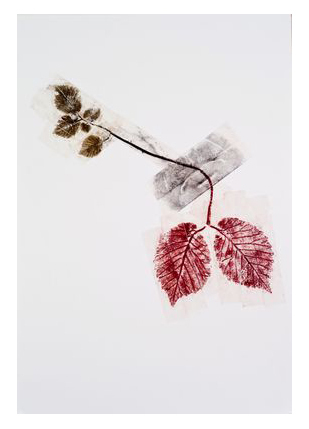 The lines on the paper suggest that the paper also has nerves, the same as the leaves lying on the paper. 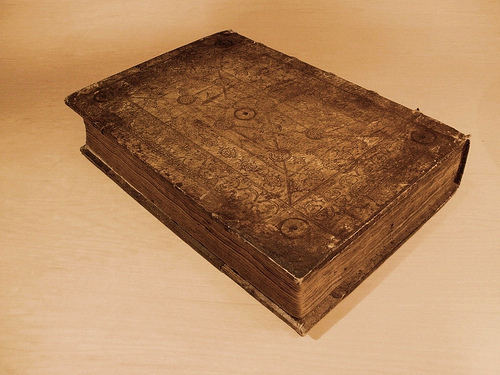 Next to that the book has a limp binding, animal skin that is prepared to print and write on functions as the cover of the book. Where the animal skin again has a pattern that can be seen as patterns of plants. 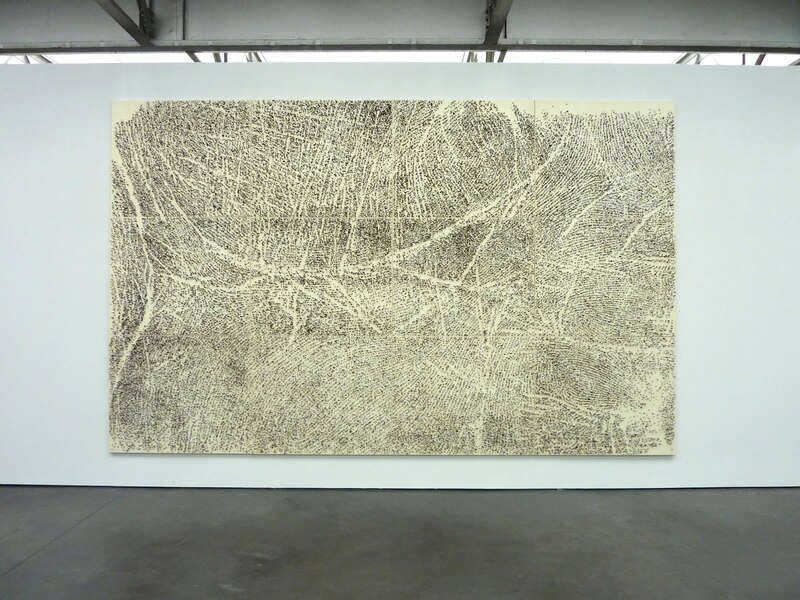 The arte povera artist Guiseppe Penone compared the skin, mostly very enlarged, to the bark of a tree, and his fingerprint to leafs. 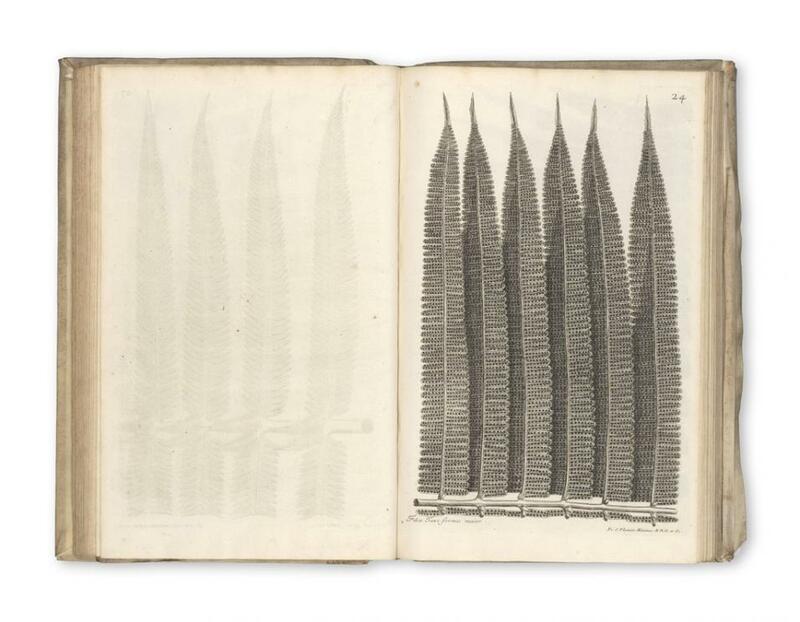 His drawings, partly printed as this book is, are the best example where all these aspects come together. The printed leaves with their, in Penone’s work, very outstanding nerves on a soft sheet of heavy paper and rough fibered paper. They are directly connected to the mouth as forming one plant. In this book where leaves are growing in the books shape, but also the other way around the book, looking like a plant too, aspects are mixing up creating a bit of an unlikely but beautiful image. The first time I saw his book was at a gallery, which let’s agree it’s not the most intriguing place for displaying books since we didn’t have the chance to go through the pages, but the positive side of it was that it made me even more curious about the content of the book and helped me to analyze my primary choice I had to choose among an array of books from different ages, designers, concepts and styles. it relies only on its visual qualities. But not only that, it lacks any hint of subject on it as well so it triggered me to step closer. 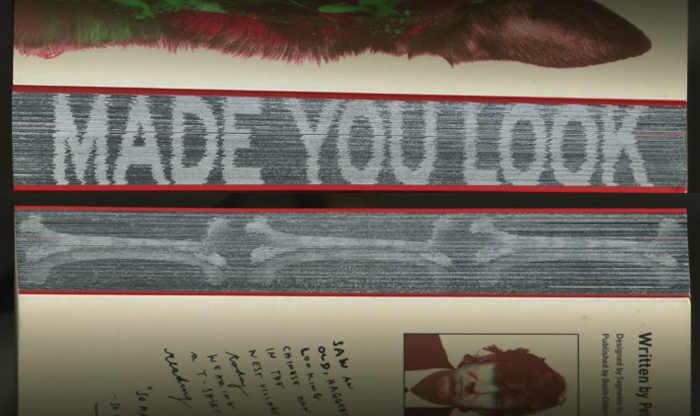 At first look I saw a book with a portrait of an animal referring to a wolf, but the closer I went to the image the more information started “appearing” on it by different layers.That combination of overlaying made me curious even more. 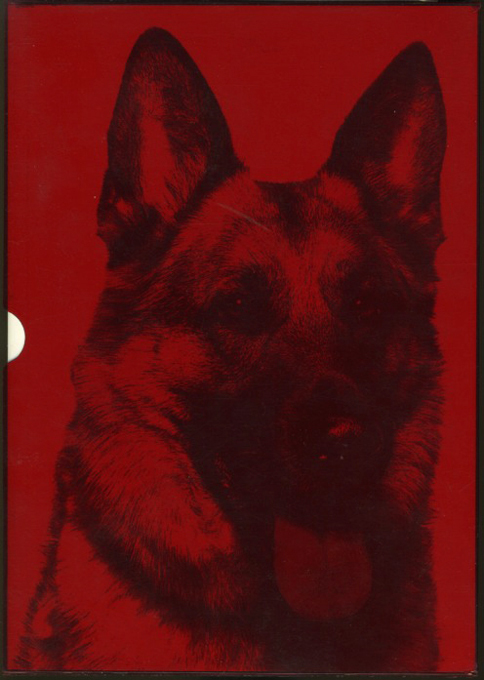 When it is in it’s red plastic cover a perfect, friendly and appealing portrait of a German shepherd is displayed on the surface, but once you remove it, the mood of the dog changes by an added green layer and it doesn’t even look like dog anymore. It adopts a dualistic grotesque-creature shape which fascinated me instantly. I found this interaction between all the elements very intriguing. Further in my investigation I figured out that it’s a book covering 20 years of graphic designs by Sagmeister, INCLUDING THE BAD ONES. Cover and content, the duality of our showing on the surface what people want to see, but giving them the chance to look on the other side as well. 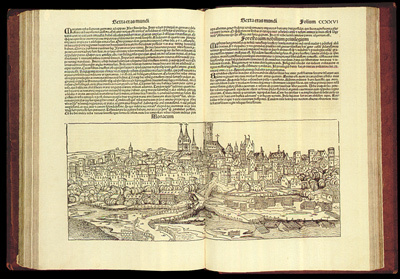 Nurenberg Chronicle, from 1493 written in Latin by Hartmann Schedel and illustrated by Michael Wolgemut, is a biblical paraphrase (incunable), world known because of it’s impressive woodcut illustrations, and the impressive quantity of them, making it the most richly illustrated book of the incunable period. 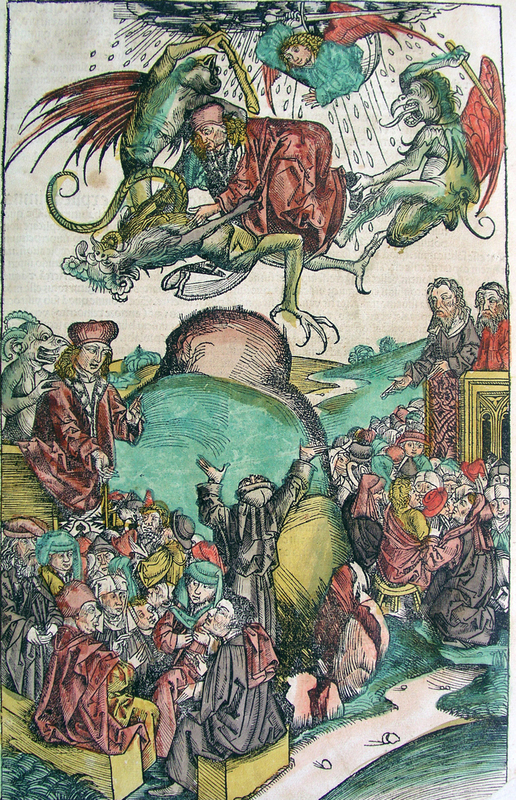 I chose this book mainly because of the woodcuts, and their (religiøse fortællinger-ord?!) value. 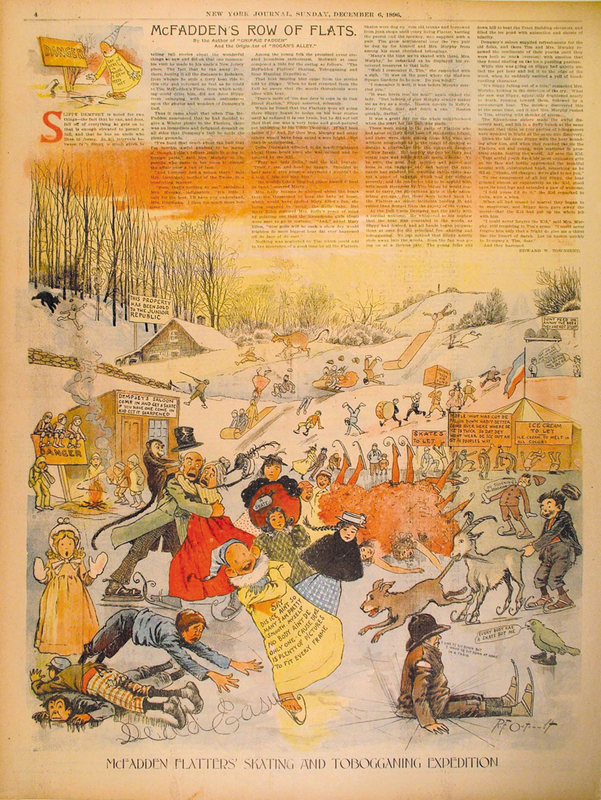 The illustrations were colored afterwards (mainly with watercolors and tints), by different artists, and I like the lightness of the colors, compared to the heaviness of the text-printing, which is dense and firmly detailed. The coloring makes the illustrations (subjects) more digestible and vivid. Still the illustrations are very strong and loaded with absurd, fairytale-like figures and settings. The fact that the images are so strong and prominent made me think in the beginning, that the book in it’s time, the 15th century, was somehow not elitist, as was the case in general for books- if one couldn’t read, there was no access to the content. 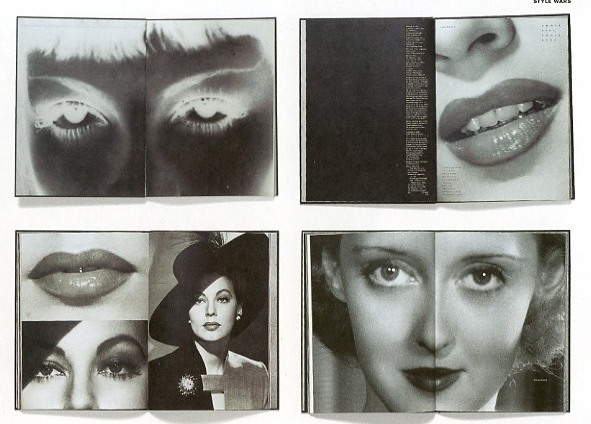 With so many images, the book invites the illiterate to understand the stories and messages. 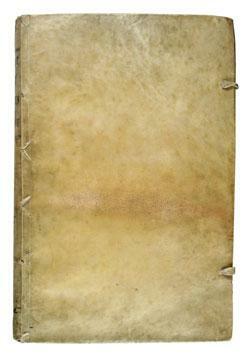 But on the other hand, the book must have been such a luxury, so only some certain groups of society had access to it. Though the Chronicle was also published shortly after the Latin version, in a German one, what might have spread the notion of it in the countries closer connected to the German language. I would have liked to have an impression of how approachable the text might have been, compared to the immediateness of the images. So, I made my choice by instinctively being attracted to this (both imagery and textual) classical, mastodon piece of historic religious literature. A Printed Book History 7 : Außen – Innen : was ist drinnen? When it comes to the background of my choice, I pick something that is organized, especially when I pass the day which is quite unfocussed. 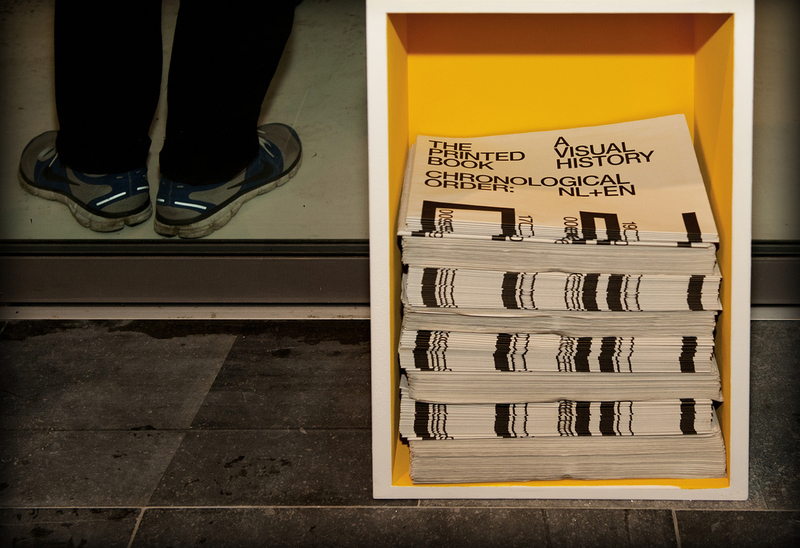 What I mean ‘Organized’ in this context is, something simple, straight, and propagating a messages well whatever it is. On the way to the exhibition place, many different things on the street were distracting me a lot. Also the fact that i need to see many things at the place, made me think about only rest. Fortunately, a scale of the exhibition was not that large, besides the thing that i wanted to see was very clear. 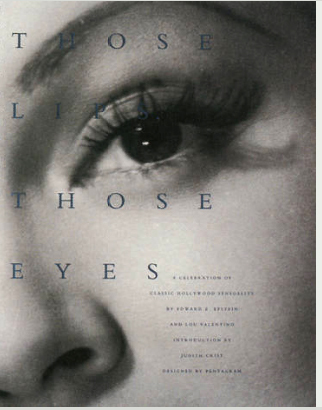 Although there were tons of texts that had enough power to give me a positive impression, I was looking for a book which had a story or visual language as simple as it can be. In the last part of the exhibit place, I found the image that i was looking for. It was a book with a simple Isotype image with few colors but very skilled way of drawing. The image was telling a story very well. The only pity was, that the full text was written in German, which I can not understand. However, the Isotype-styled image was intriguing enough for me to look at. Even though it was based on a spontaneous choice, I liked it quite a lot. 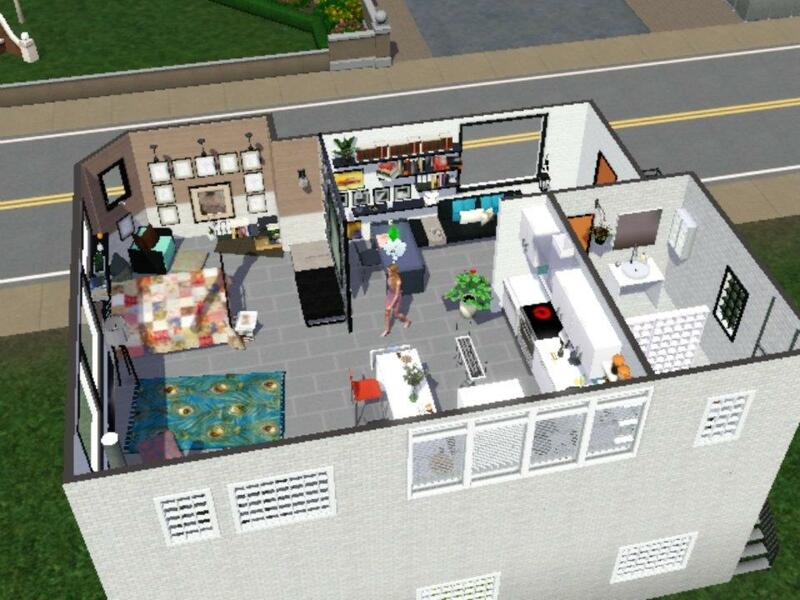 Because of a connection between the motive of my choice and the memory from my childhood, imagining the time, I was drawing a number of sketches for my dream house and played a game about building a house and making a story out of people living in that house. I enjoyed telling a story with a basic image, which gives a hint to what kind of upcoming story will be expected. The memory of mine and the image from the book in front of me were connected very well. That is why I felt interested and considered this book to be my favorite among other books. Maybe the Isotype drawing was simply nice. It was a simple thing but made me feel happy on that occasion. The book I found was:’Außen – Inne’ : was ist drinnen? ( what’s inside? ) by Marie Neurath Vienna 1956. 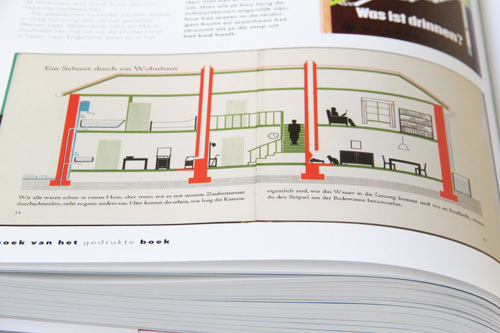 Marie Neurath (1898-1986 and husband Otto worked according the “Vienna Method”. which was later renamed Isotype: International System of typographic Picture Education. With my clothes still wet and after being forced to leave all my stuff in the lockers, I was finally ready to be impressed by one of the books in the vitrines. We were the only visitors at the whole “UvA Special Collections”, and after the difficult and rainy bicycle ride we were no more than 10, a small group from different nationalities which in a way resembled the layout of the Complutensian Polyglot Bible. 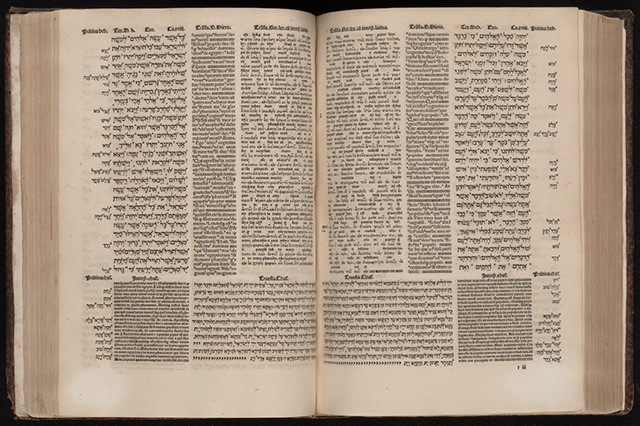 Printed in Alcalá de Henares, Spain in 1514, it was the first bible made in more than one language, Hebrew, Latin and Greek. Translation is always a problematic thing to do, specially in such as “precise” text as the Bible but not only in terms of meaning, using the same book for more than one text seems like a pretty risky design work. 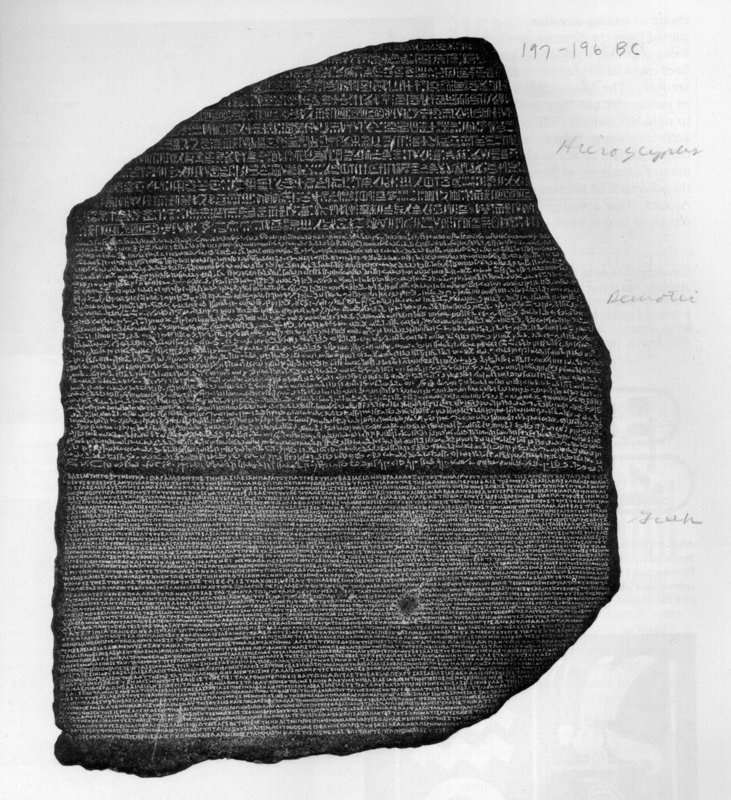 The first example of such a hard labour would probably be the Rosseta stone [x], that became the most useful tool to understand the hieroglyphs from old Egypt. Made in 196 b.C and as well in three scrips, Egyptian, Demotic, and Ancient Greek, but with a pretty classical way of arranging the different languages, in three different paragraphs. 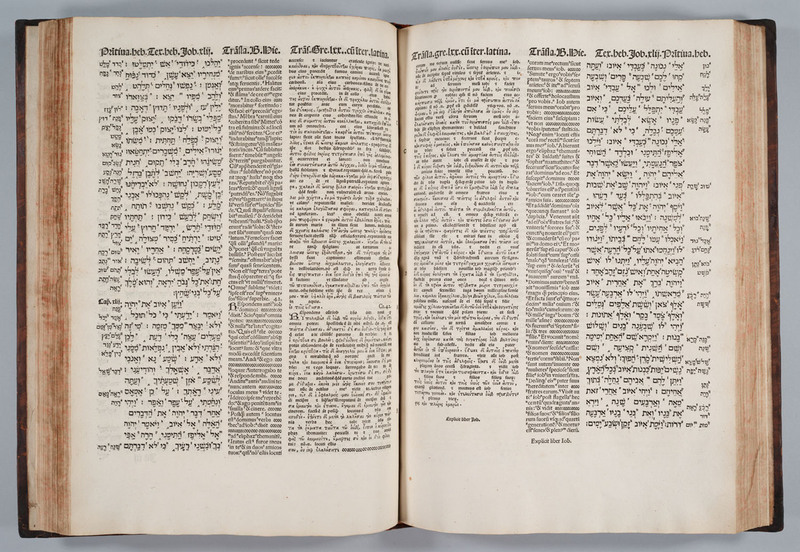 The main characteristic that makes the Polyglot Bible specially appealing is precisely the way that the text is arranged in the page, in parallel columns of different sizes that also combine different ways of reading (as it happens with the Hebrew and the other two languages). That idea seems really modern, and the look of the page looks quite similar to the once of a modern newspaper. 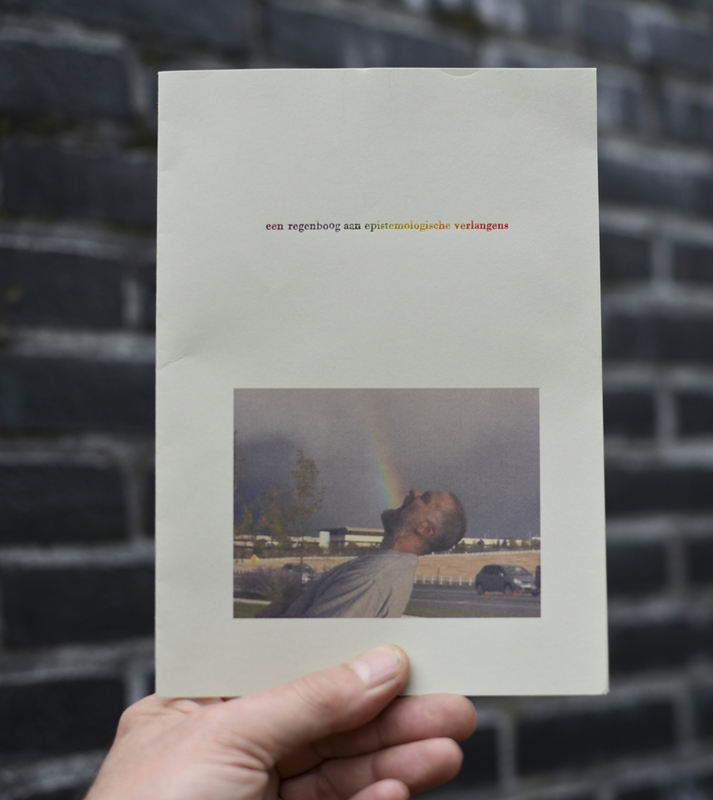 If I think in contemporary polyglot texts the first examples that come to my mind are the magazines from the airplanes or the mails from the school, and in both cases one language follows the other, so the same meaning never shares the same space with all the troubles that come with that. 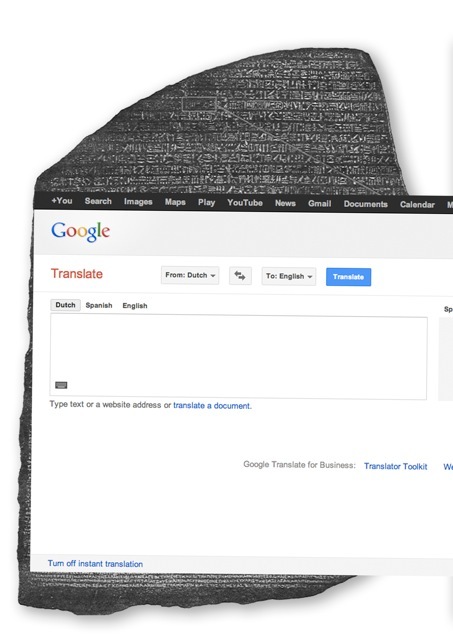 After a small mental struggle trying to remember a similar graphic structure I realize that now we can find it in something that we all use, Google Translate. Alleen al vanwege de titel verdient dit boek het om goed te worden bekeken. Er gaat zoveel bewondering maar tegelijkertijd objectiviteit en bovenal precisie van uit, dat het direct mijn aandacht trekt. Evenals het formaat overigens, wat vrij groot is – daar houd ik van. Het maakt het lezen, het bekijken van de letters en de illustraties tot iets gewichtigs. Iets heel fysieks. De titel en het formaat maken hun beloften waar. In ‘Over de voortteeling en wonderbaerlyke veranderingen der Surinaemsche insecten’ vertelt Merian in beeld en in taal op een degelijke maar heel betrokken wijze over het onderzoek dat zij deed naar insecten, tijdens haar verblijf in Suriname. Haar observaties beschrijven de werkelijkheid, maar vullen de werkelijkheid ook aan. Het is met name dat wat ik erg mooi vind aan dit boek. Ook haar woordgebruik vind ik bijzonder. Dat gaat natuurlijk al gauw, omdat de taal die ze gebruikt in deze tijd zo ongewoon is. Maar de manier waarop ze de woorden naast elkaar zet, met een goed gevoel voor ritme, zorgen dat de zinnen me bij blijven. Vooral deze, hoewel ik die opschreef: ‘De kleine gecoleurde bladeren, dicht onder de vrucht zyn als een rood fatyn met geele vlakken vercierd, de kleine uitspuitzels aan de kanten groeijen voort als de rype vrucht afgeplukt is, de lange blaaden zyn van buiten ligt zee groen, van binnen gras groen, aan de kanten wat roodachtig met scharpe doornen voorzien.’ De tekening begeleidt de tekst perfect; de twee slagen er wat mij betreft in om naast elkaar hetzelfde en toch ook een ander verhaal te vertellen. Geen van de twee maakt de ander overbodig. Ze vormen samen een charmant geheel. 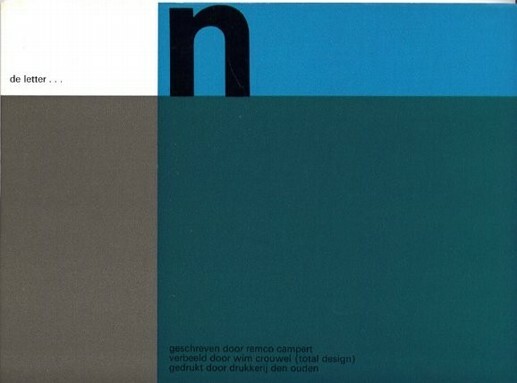 At “The printed book : a visual history”, I was most interested in the book “De letter… n” by Remco Campert and Wim Crouwel. What attracted me most was its’ hard, yet clean graphic style. The book was opened on a page that read ‘raket bom mes oorlog’, ‘rocket bomb knife war’, in thick black letters of various sizes on an orange and white background. ‘Raket bom mes oorlog’: every word gets its’ own separate line. The opposite page displays an orange ball that may remind us of the sun or, in this context, may just as well be a nuclear explosion. 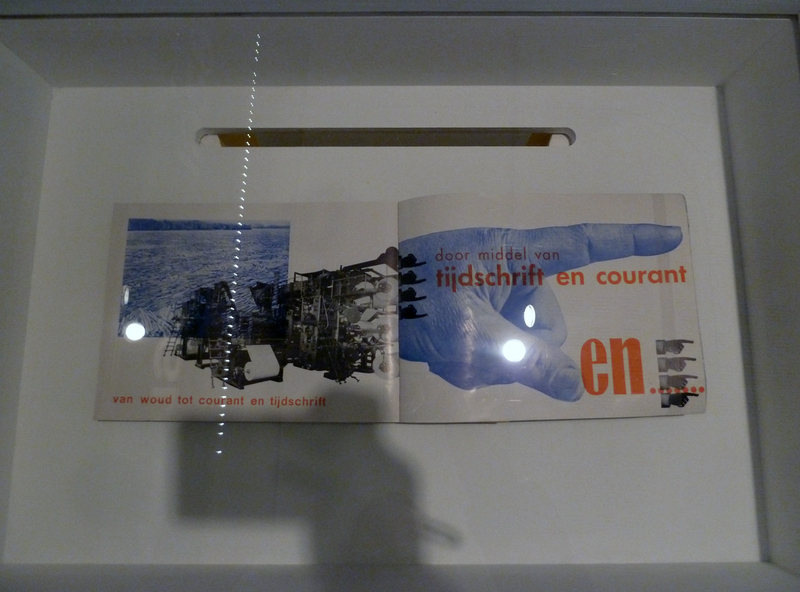 As the books in the exhibition are set up in glass cases, I wasn’t able to flip through the book so, maybe because of the content of this particular page, the graphics in “Het gejuich was massaal”, a book about dutch punk the the late 70s, immediately came to mind. Looking at the page again, something else comes to mind. 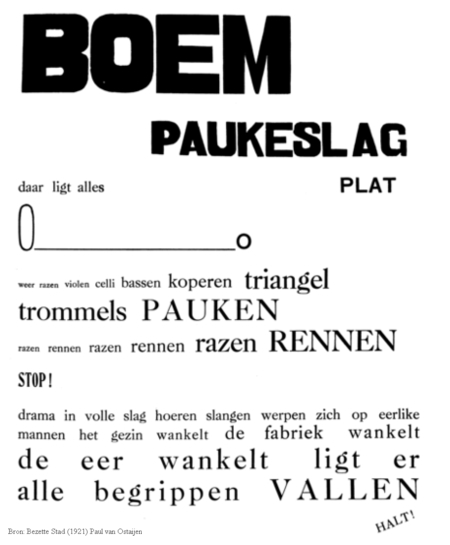 Paul van Ostaijen was a Belgian poet who started experimenting with typography in his poems in order to translate, among other things, rhythm and sound to the reader. He started in the 1910s with quite safe try-outs, mostly experimenting with different letter-spacing and word-spacing. In the 1920s, he went all out and experimented in a big way with font types and sizes. His best known example is “Boem paukeslag” from his 1921 book “Bezette stad” (“Occupied city”). In this poem, single words – keywords really – are connected and form some sort of narrative through the use of typography. 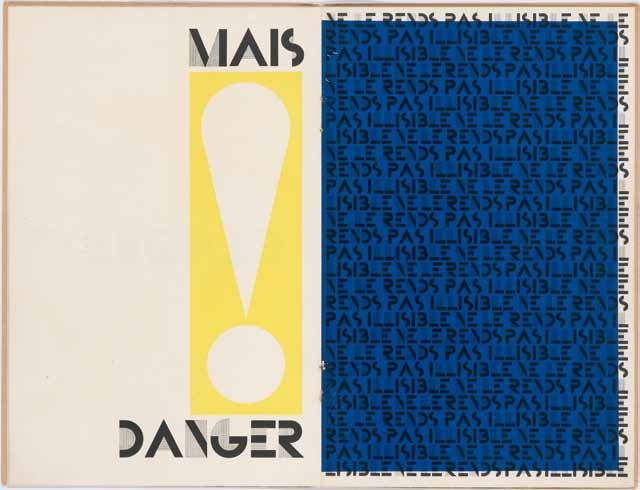 In a similar way, raket bom mes oorlog are keywords but form an understandable whole due to the rhythm and context that is created through the graphics and typography.